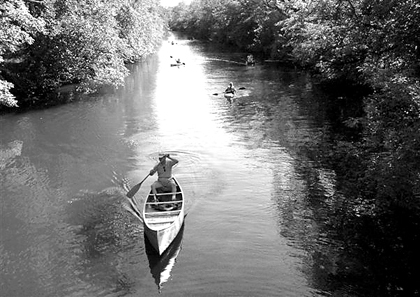 SUMMER IDYLL: What better picture of the essence of late summer serenity than a sunny, lazy Labor Day with canoes and kayaks on the Delaware and Raritan Canal? Just days before Princeton University's undergraduate population began to return to campus, two e-mailed bomb threats this week presented the ultimate test in a new security alert system designed to keep members of the University community out of harm's way. The Princeton Regional Schools Board of Education held a regular public monthly meeting on Tuesday, August 28, at 8 p.m., in the cafeteria of John Witherspoon Middle School. Board President Michael Mostoller noted the end of construction after almost five years at Princeton High School and said that things were on track for the first day of classes tomorrow, Thursday, September 6. The prospect of building senior housing in Princeton Township has brightened, then dimmed, only to be illuminated again last month when a Bunn Drive senior housing project that had once appeared to be completely dead in the water suddenly came back to life. It's no coincidence that the eco-mantra "Reduce, Reuse, Recycle" is not only somewhat catchy, but arranges its ideals in level of importance. A roving elected official would typically be involved in imparting some kind of wisdom to an eager audience, perhaps getting paid handsomely in the process. In October 2005, Princeton resident Jimmy Fang had a headache that changed the rest of his life. It was a tough night for the Princeton University men's soccer team. Growing up as the son of a Major League baseball player, many would assume that Will Venable always dreamed of following in his father's footsteps and was destined to a career in the big leagues. Wayne Sutcliffe doesn't mince words when he discusses the goals this fall for his Princeton High boys' soccer team.